She's your everything and you wish you could give her the world, but your eternal love will just have to do. The great thing about these big marriage milestones is that they're a sensational excuse to spoil your wonderful wife and show her how much you truly care. The hardest part of finding anniversary gifts for women shouldn't end up being about the money. Remember, they don't want your money honey, they want your love! 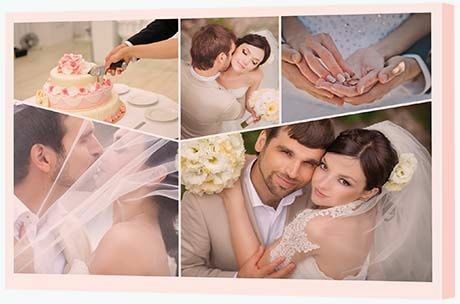 A photo gift, ranging from the gorgeously affordable to the lavishly luxurious, is the ideal anniversary present for all budgets. 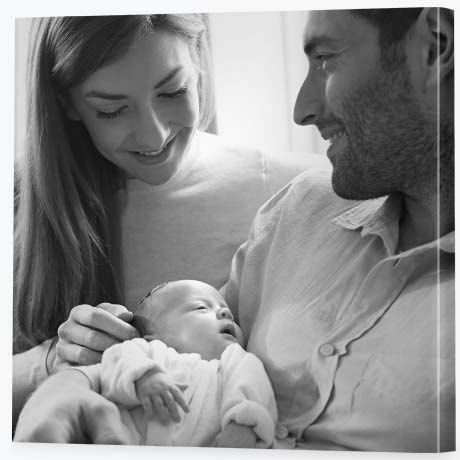 Bring her love of family - of you and her kids - to life with a beautiful modish heart canvas. This gift from the heart will make her smile whenever she sees it throughout the year. A family collage featuring photos of you, the happy couple together, as well as photos of the kids, will become a treasured part of the home. A collage is a terrific way to feature the best of the best of family photos that deserve to shine. Find a wedding photo she hasn't yet put to canvas and give it the royal treatment. Take one of her favourite wedding photos - perhaps a close up of the romantic ring exchange - and split it across four panels to create a beautiful work of art. Printing on acrylic glass will give it that extra special feel. Fancy a hot tip? With spilt image designs, try to take care about where you split your image as you don't want to cut off important bits. For example, you'll see in this image the wedding ring exchange - the focal point - is featured in the centre of one of the frames. You wouldn't want to split it half way across the ring exchange. Show her how much you treasured that amazing adventure you took together after you married. Some couples head off on their honeymoon immediately after the wedding. Others leave it for a couple of months, waiting for the perfect time of year (or perfect amount of money!) to escape together. Either way, it makes for an amazing way to celebrate your love. Honour those times each and every day with a spectacular metal wall display of all the wonderful things you did together. Whether it was 2 years ago or 20 years ago, the honeymoon is never over with gorgeous photo art like this. Celebrate the selfie with an anniversary gift she'll put pride of place in the home. The wonderful thing about this three frame canvas wall display is how perfect the centre frame is for a quote or a poem. Have a think about what it is that brings her joy and remember, there's no shame in the selfie! In fact there's not enough selfies being printed to canvas. 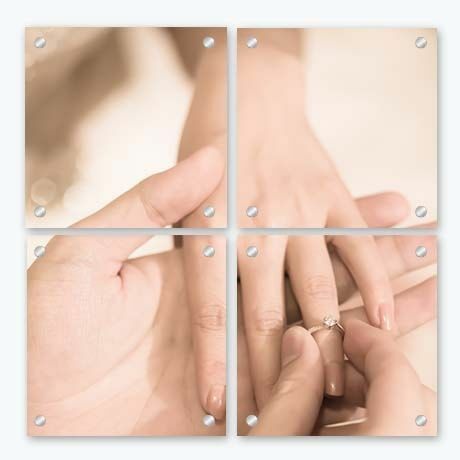 Celebrate your together forever love with a romantic canvas quote and two spectacular selfies. 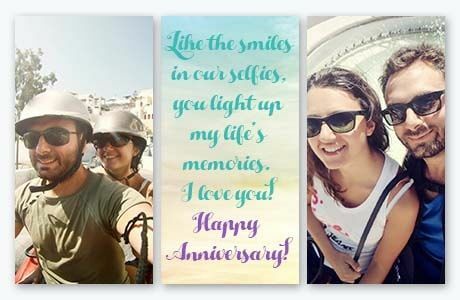 Collages make one of the best anniversary gifts for her, with the opportunity to feature an abundance of photos. 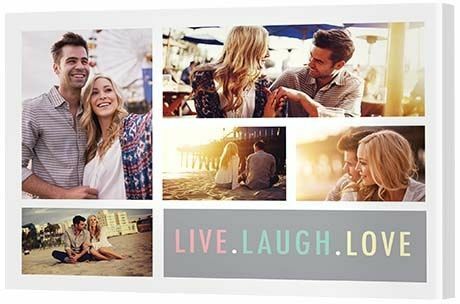 Use bright, happy, fun-loving photos of the two of you enjoying time together to build a collage around this funky 'Live. Laugh. Love' themed collage. There's something about those small moments that often deserve remembering as much as the big. This collage idea is all about collecting those candid shots - those photos that make you the couple you are. This gorgeous gift means she'll no longer have to lament throwing your gift of flowers in the bin. There's no better way to keep flowers alive than to print them to glorious acrylic glass, a material that will see them shine on for years to come. Find some royalty-free floral photos online or sneak out to the garden and take a photo of something from her prized collection. This creative split image canvas is a glorious way to feature fresh, colourful floral bouquets; a wonderful symbol of everlasting love. Make a splash with romantic red, a dazzling feature of this silhouette canvas collage. Step outside the traditional wedding display to create something super special she'll enjoy featuring on her desk at work. 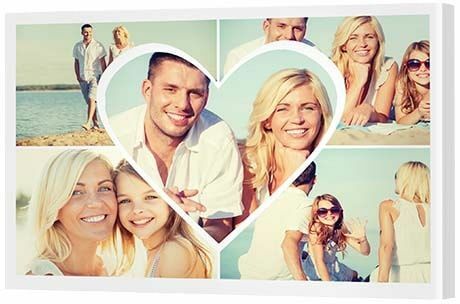 This affordable silhouette collage provides frames for six different photos, so gather together some of your favourites and upload them onto our online collage builder. When you're creating this collage, you can choose any wrap colour you choose. We chose red as it perfectly matches the detail in the photos. The opportunity to change the wrap colour will be revealed under 'Choose a wrap style'. When this prompt comes up, simply select the colour you'd like to use from the options available or add your own Hex Colour Code. When you click to select a custom colour, you'll even have the opportunity to use an eye dropper tool to select a colour from your image to use in your wrap. 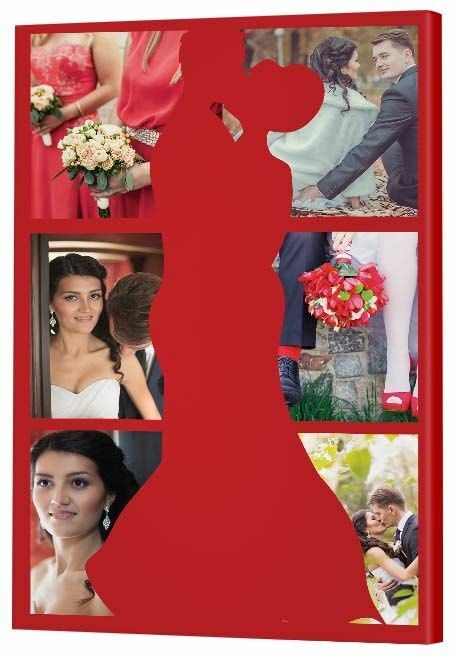 Silhouette collage templates all provide this option, so if you're not a fan of the couples template you can, instead, choose a heart template or something else that's more 'her'. If your wife loves gifts that are a little offbeat and arty, she'll love this simple yet stunning monochrome print. Find the photo that sums up the life that you're sharing together right now and print it to canvas so you'll never forget. Sometimes one single, special photo can have so much impact. Wondering how on earth you create a black and white photo? Don't even worry. Our online canvas app lets you remove the colour and convert it to greyscale without needing access to any other graphic design tools. Surprise your wife with an artful anniversary present and watch her smile from cheek to cheek. 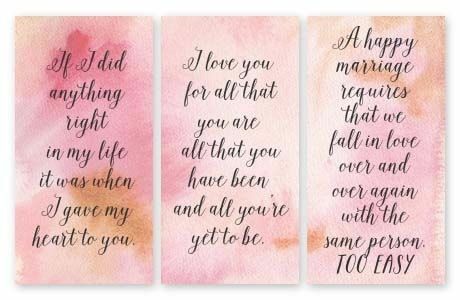 Open your heart and show her how much you care with a gorgeous wall art series of loving quotes. Sometimes saying 'I love you' is enough. For a wedding anniversary, consider a grander gesture. If you don't already have some favourite love poems that you share together, let Google or Pinterest do the romancing for you. Simply type 'love quotes' into the search bar and an abundance of ideas will come up. A display like this is best created in a graphic design tool like Canva first then uploaded onto Canvas Factory's canvas app to print. Finding the right anniversary presents for her can be tricky business, but this gift is guaranteed to bring on some happy tears. Woo her all over again with a modish collage complete with feminine styles, with a pale pink custom wrap colour. If she's into bolder or brighter, you can choose any wrap colour you like, so get those wedding photos together and create a stylish gift. Super easy. Incredibly impressive. Just wow! 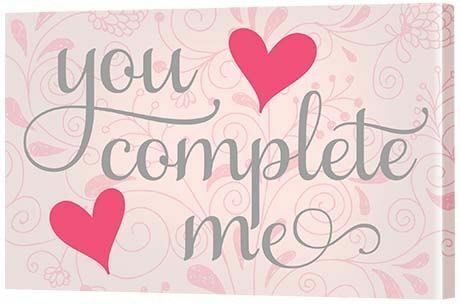 Find exactly the right words and place them onto a canvas print so she'll always remember how you feel. 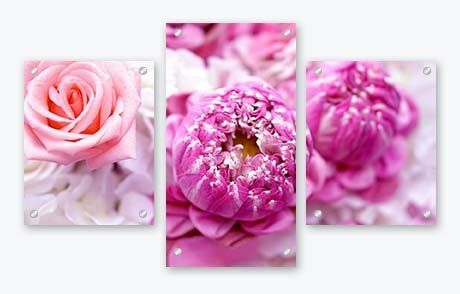 Design a customised art image then print it onto a single canvas print for a gorgeous statement piece. Who knew a three word slogan could make such an impact? The key to making this gift great is keeping it short and sweet. Oh - and finding a graphic designer to create a pretty image, of course.